There are more ways to get high-quality moonshine than that local guy at the bar in the middle of nowhere. Believe me when I say that, i’ve come across moonshiners in country bars that make and sell it out of there home. 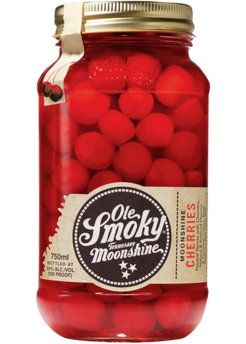 Thanks to Ole Smokey Distillery getting your hands on the authentic stuff is as easy as heading to your local Payless! Ole Smoky was actually the first licensed distilleries in East Tennessee, and is now one of the most frequented tourist spots in the Smoky Mountains. When it comes to moonshine, there’s a plethora of flavors to choose from. Ole smoky produces a wide variety of different flavors and proofs. Some of their most popular products include: Original Moonshine (100 Proof), White Lightnin (100 Proof), Moonshine Cherries (100 Proof), and Apple Pie Moonshine (40 Proof). You can view a complete list of their flavors and proofs here. The Original Moonshine is for those wanting the authentic moonshine experience. This product is a combination of 80% corn and a top-secret ingredient. The result is a high-octane and extremely bold flavored moonshine! Some of the flavored Ole Smoky products make for great cocktails and they even shared a list of recipes on their site for inspiration. We are offering a number of Ole Smoky tastings across various locations in Indianapolis through December. Be sure to check out our events calendar to find the most convenient location for you! And, there’s another thing we are extremely excited about and thats Moonshine Minis! If you aren’t sure what flavor is for you, you can pick up a few different 50mL jars to decide. Moonshine Minis also make the best stocking stuffers and gifts for co-workers and bosses. Go on now, get yourself a Party in a Jar!